On Monday, I experienced what millions of people were doing decades ago: I read Harry Potter and the Goblet of Fire until 1:00AM. No way was I going to go to sleep on a cliffhanger! Earlier in the evening, my housemate got home just as I started to scratch the surface of the most intense part of the book. He tried to ask how my day was, and all I could utter in response was, “Good. I’m at the end of the maze.” He rightly took that as his cue to leave me alone to get lost in the story. I spent most of the next couple hours with either my hand over my mouth in shock or my eyes bugging out of my head as J. K. Rowling brilliantly brought this 700-page masterpiece to its dramatic conclusion with some of the craziest, mind-blowing twists I’ve ever read. I gave up a long time ago on the law of Thou Shalt Read Slowly and Savor, and these intense nights of binge-reading have become a defining characteristic of this summer as I read the series all the way through for the first time (I know…I know…). I read the first two books in third grade, but as my parents can attest, finishing them was like pulling teeth, so after that unpleasant experience—and having never really been hooked on the movies—I assumed that Harry Potter just wasn’t in the cards for me. Quite the opposite has proven to be the case, though, as I increasingly prefer staying home to read over pretty much anything else. Since the wizarding world is all so new and exciting to me, I can talk about it for hours. When I arrive at work in the morning and a coworker asks how my weekend was or if I did anything the night before, my response, more often than not, involves Harry Potter, and I start to get animated as I talk about what I’ve been reading. I often get teased for just now joining conversations that most people were having ten or fifteen years ago, but no one seems to mind as they fondly remember their first encounter with Harry Potter. Almost everyone I talk to comments that they would pay a large sum of money to have the plot completely erased from their memories so that they could read all seven books with fresh eyes. Now that I have only three books left, I genuinely am starting to worry about what I’m going to do when I finish the series. Taking recommendations for support groups and books to fill the void. Just when I thought the series couldn’t get any better, Rowling so artfully incorporated allegorical elements that add another level of depth to the story. At first, I thought it was just coincidence but later found out that Rowling is actually a professing Christian, taking my obsession to the next level. At the beginning of The Sorcerer’s Stone, Harry is rescued from his insufferable aunt and uncle, who he was sent to live with after his parents died, by good news that comes flooding in, in the form of letters from Hogwarts, and meets him exactly where he is—literally, the letters are addressed to the cupboard under the stairs that serves as his tiny bedroom. When his Uncle Vernon tries to prevent the letters from arriving by boarding up the mail slot and dragging his family to a rickety house in the middle of the sea, the letters still manage to find Harry. 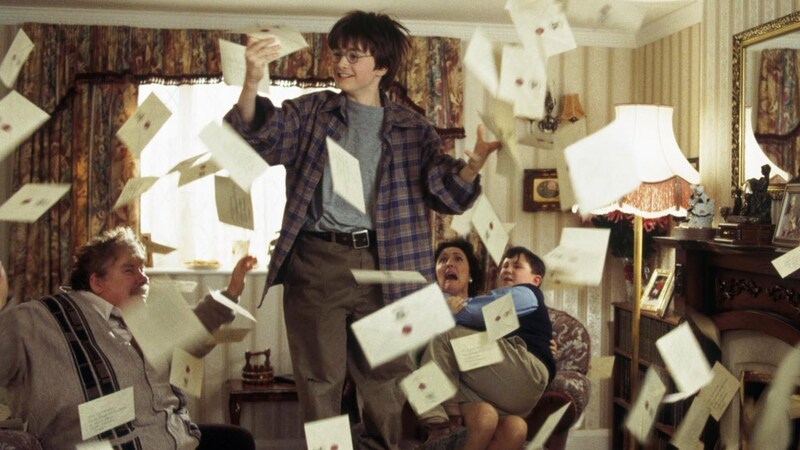 Hogwarts, determined to get this news to Harry, ultimately sends Hagrid, the giant Keeper of the Keys, to hand-deliver the letter that contains his acceptance to the school. Hagrid comes to Harry with the hope of something beyond his current circumstance, the hope of a place where he is loved, accepted, and even lauded. Harry receives this wonderful news, not by willing himself to be a wizard or reading self-help books about how to acquire magic but simply by existing (and accidentally unleashing a snake on his irritating cousin). Your mother died to save you. If there is one thing Voldemort cannot understand, it is love. He didn’t realize that love as powerful as your mother’s for you leaves its own mark. Not a scare, no visible sign…to have been loved so deeply, even though the person who loved us is gone, will give us some protection forever. It is in your very skin. Quirrell [the professor who Voldemort possesses], full of hatred, greed, and ambition, sharing his soul with Voldemort, could not touch you for this reason. It was agony to touch a person marked by something so good. His mother left upon him the traces of her sacrifice…This is old magic, I should have remembered it, I was foolish to overlook it. […] I miscalculated, my friends, I admit it. My curse was deflected by the woman’s foolish sacrifice, and it rebounded upon myself. Voldemort, being so evil, could not conceive of or anticipate a mother making that kind of sacrifice for her child. 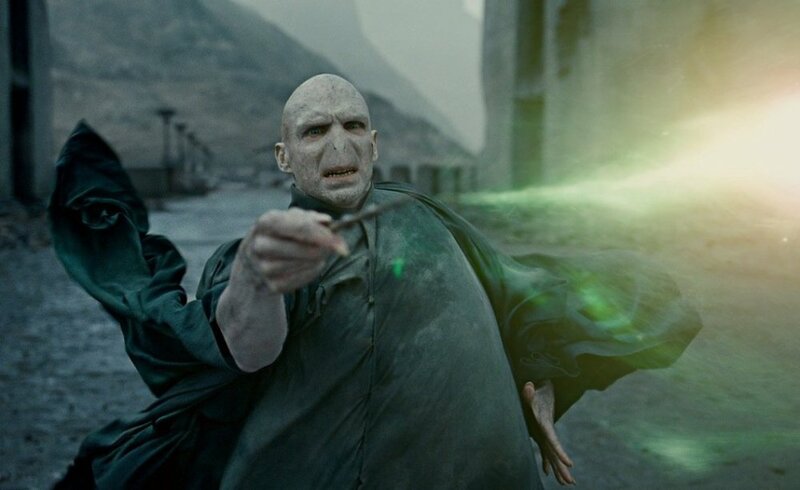 Although Voldemort demands sacrifice from his followers, lauding those who would rather be sent to Azkaban than renounce him, his demands do not come from any kind of love for the Death Eaters but from his own selfish ambition and thirst for power. Fortunately, we belong a Lily-and-James-Potter-esque Father who sent his Son to deflect the curse of sin and death on the cross, who loves and forgives us regardless of the ways we fail to show our loyalty to him. So good, Margaret. I read them years ago but am re-reading Sorcerer’s Stone to my kids (who are miffed that I am reading to them and want to read them alone.) I’ll let them read the rest alone, but had to be a part of this – the first one. We DO belong to a Lily-and-James-Potter-esque Father! And the One who died to save us now LIVES! ps – How were you in Advent youth group with me and had not read the rest of these? I feel like I talked about them a ton!?! Ha! When Potter books first appeared, I believe it was Dennis Rainey’s ministry, Family Life Today, that promoted the horrors of reading these books and turning your kids into sorcerers and devilish wizards. Many of our conservative friends, and our church, adopted that philosophy, so we steered our kids away from those books. Since then, our oldest son has devoured the books even reading them twice and the movies have become a favorite. I lost count how many times our college-age kids have viewed them. The author has created a phenomenon of creativity and wonder, and it’s sad that come conservatives struck a cord of fear and anxiety over such inspired writing. My whole family would give anything to have the books erased from our memory so we could read them anew. We’ve all read them through twice and my daughter six times.